Do you ever have trouble talking to your teen? If the answer to that question is ‘no,’ you either don’t have a teen or you have an exceptional one. So, yes, it’s normal to have strained conversations at times. But that doesn’t mean you can’t move the dynamic toward one that’s more open. Can A Hot Tub Help Me Talk to My Teenager? We believe a hot tub can help a lot. 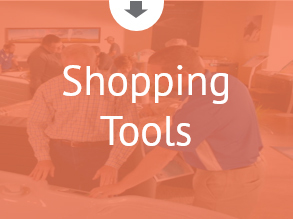 Based on stories from our customers and co-workers, we’ve heard it can be easier to strike up a conversation when you and your teen are sharing time in your hot tub. It’s a shared experience without distractions where everyone is more at ease and ready to talk. We’ve heard it can be easier to strike up a conversation when you and your teen are sharing time in your hot tub. Once you’re there, if you still feel a little uneasy, we have a few ideas you might try to get a conversation started. By the way, we believe these ideas apply to anyone, not just teens. An open-ended question requires more of an explanation and can get a conversation primed and running. An example would be “What’s the best dream you’ve ever had?” The answer requires thought and explanation. It’s not flawless, because if someone doesn’t really want to talk, you’ll just get a ‘dunno’ answer. If an open-ended question technique doesn’t work the first time, try again later. Know whom you’re talking to. If you have a taciturn boy, you wouldn’t want to ask “what’s the last thing that made you cry?” or “who’s your secret crush?” But if you have an emotive daughter who likes to talk about her feelings, those might be reasonable conversation starters. Don’t become judgmental once you get an answer. If you ask for a favorite book and the answer is a Spiderman comic book, don’t frown and suggest Dostoyevsky. Instead, consider it a reasonable answer, and follow up by asking why. Is it because she likes the graphics and the way words and pictures work together? Is it because the story moves quickly with lots of action? Has she ever thought of creating a plot herself? Could Spiderman beat Batman… you get the idea. A conversation moves from a single starting point. Let it roll rather than just jumping to a new, unrelated question. One or two questions are sufficient for a small conversation. If you toss out too many, you might reveal your strategy. But maybe your teen will enjoy the game-like feel of the Q&A, allowing you to work right down your list. Your call. There is no magic to this list. It wasn’t created by a famous teen psychologist or a focus group. It’s not science. The questions are merely suggestions based on the idea they should be non-threatening and fun. Maybe the list will inspire better questions for your teen. Remember, though, be willing to supply your own answers to the same questions. Conversation is a two-way street. When you can custom design your pizza, what goes on it? If we completely cleared out your bedroom, everything, and you got to redesign your room into your personal retreat, including furniture, what would you do? What’s the best ice cream ever? What’s the coolest car ever from any year? What’s the best book you’ve ever read? Was it just the story or is there something about the way it was written? Do you dream in color? Do you have any recurring dreams? If you could take a trip to one place anywhere in the world and stay there for two weeks, where would you go? If we could transport this hot tub to anywhere on the planet and soak in it for 30 minutes, where should we put it? Would you rather be the best mathematician in the world or the best artist in the world? Superhero talent: Pick one and explain why: ability to fly, invisibility, bulletproof, time traveler, ability to appear instantly anywhere in the world. Who is your favorite musician or band? Who’s a close second? Would you rather be a famous athlete or a famous musician? If you won the lottery, what’s the very first thing (not biggest or most expensive) thing you would want to buy? What’s your favorite sound in all the world? Would you rather live in a seaside town or in a mountain resort town? If you could drop anyone into this hot tub right now instead of me for a 30-minute conversation, who would it be? Don’t press. If it’s not happening today, it’s not happening. 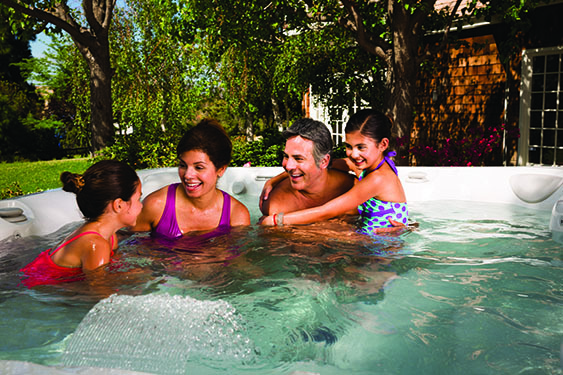 Your hot tub is an ideal place to try to get the conversation started. Wandering off is not as likely, and distractions are minimized. There’s no phone to look at. It really is an ideal place to have a one-on-one conversation. Why not give it a try? Will a Hot Tub Help you Talk to Your Teenager? What’s the adult/teen dynamic like in your home? Do you find it easier to connect and have a conversation while you’re in your hot tub? Do you think that’s because you’re confined in close proximity or is there something about the relaxing way the hot tub makes everyone feel? We’d love to know how it works for you, even though we know every experience is unique. Need more help talking with your teen(s)? How to Talk to Teens: 3 Ways to Get Your Teen to Listen. OMG! Your teen actually talks to you? How to Talk With Your Teenagers, Not at Them. 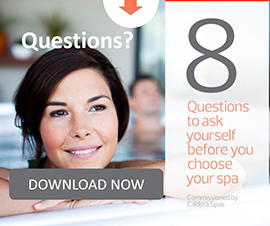 Would you like to download a free Caldera® brochure?